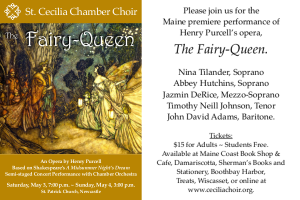 Notes: The St. Cecilia Chamber Choir presents the Maine premiere of Henry Purcell’s The Fairy-Queen on Saturday, May 3rd at 7:00 pm, and Sunday, May 4th at 3:00 pm at St. Patrick Church in Newcastle. These concerts conducted by Linda Blanchard will feature a full orchestra, and many well-known soloists, including sopranos Nina Tilander and Abbey Hutchins, mezzo-soprano Jazmin DeRice, tenor Timothy Neill Johnson, and bass John David Adams. This Restoration-era masque by Henry Purcell includes a libretto which is an adaptation of William Shakespeare’s wedding comedy A Midsummer Night’s Dream. Sure to be enjoyed by people of all ages, the piece includes beautiful, humorous, and exciting solos, duets, large choral numbers, and orchestra-only pieces. Tickets are $15 for adults, with students and those under 18 admitted free. 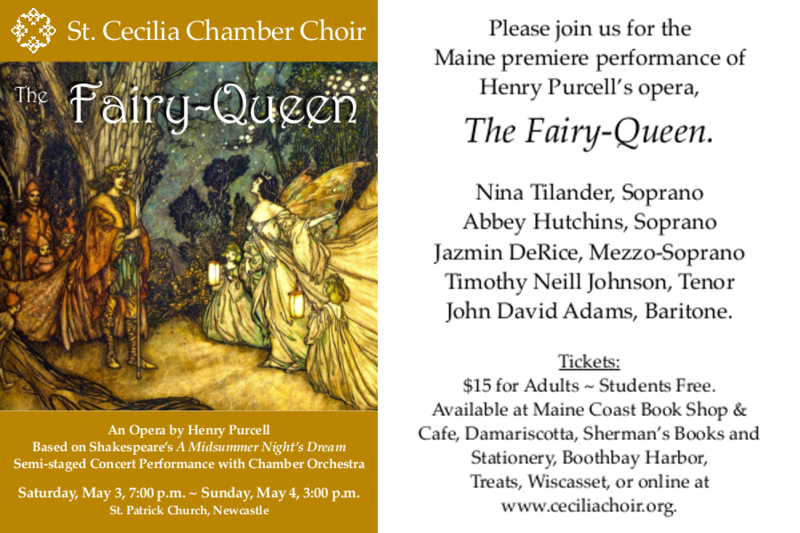 Tickets are available online at www.ceciliachoir.org, or at Maine Coast Book Shop in Damariscotta, Sherman’s Books and Stationery in Boothbay Harbor, and Treats in Wiscasset. The St. Cecilia Chamber Choir is a fully auditioned community chorus directed by Linda Blanchard and accompanied by Sean Fleming, based in Newcastle and founded in 1995. St. Cecilia’s mission is to present outstanding performances of the very best choral repertoire; to provide challenging musical opportunities to gifted local youth; to support our community with outreach programs; and to support Maine composers through the commission and performance of new music.